For most of us, WhatsApp has become the default go-to messenger, because everyone’s on it, and it’s on nearly every platform. WhatsApp has over a billion downloads on Google Play alone, the only other messenger to boast that is Facebook Messenger. The app has made itself indispensable by adding a browser version and voice calling to its platform. For those who have to deal with the app on a daily basis, we’ve lined up some interesting tricks and tweaks that will improve your user-experience. Group chat notifications can get noisy, they’re best turned off when you have to focus on a task at hand. 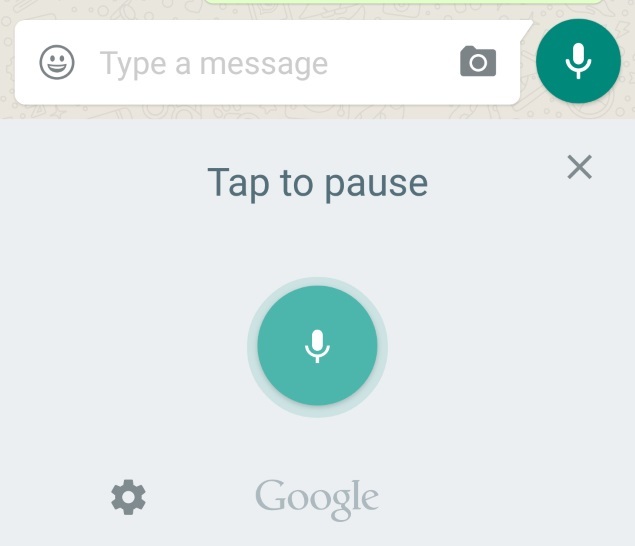 On a group chat, tap the Menu button, and hit Mute. 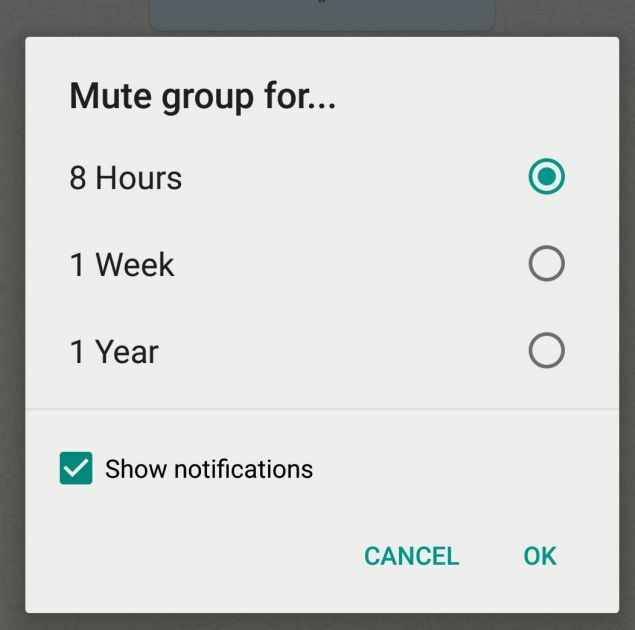 Then, choose the time-frame for which you would like the group to be muted. You can also disable notifications for the specified period. This feature is now available on the web browser too. Open Group Chat, tap the group subject to reveal the Group Info screen, and tapMute. Now, select how long you’d like notifications to be muted. Read receipts, marked by two blue ticks indicate that the recipient has read your message. Find out who has read your message on group chats. Do a long press on a message sent by you. This reveals an ‘i’ with a circle around it. Tapping on it will show you who the message was delivered to, and read by. See the Message Info screen by opening a chat with a contact or a group, then swiping your message from the left to right to see delivery and read notifications. 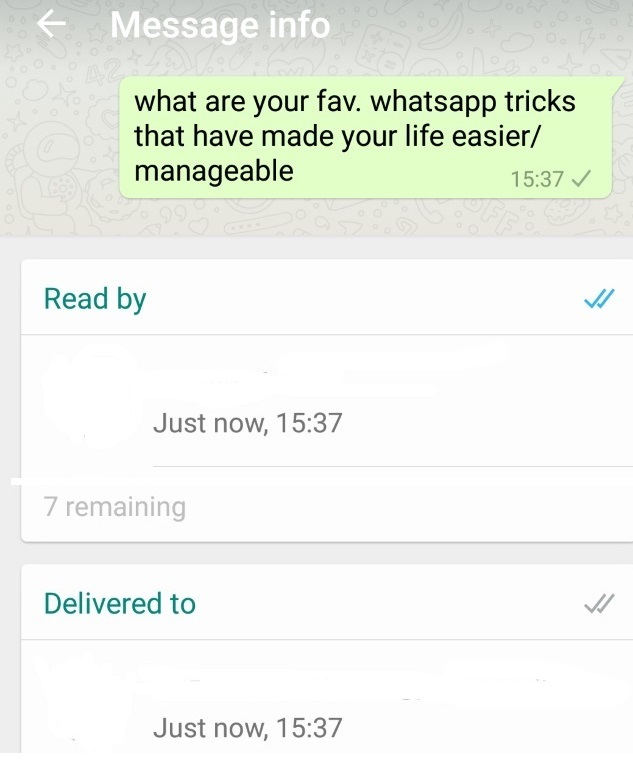 WhatsApp lets you specify what you would like downloaded on mobile data and when connected to Wi-Fi. 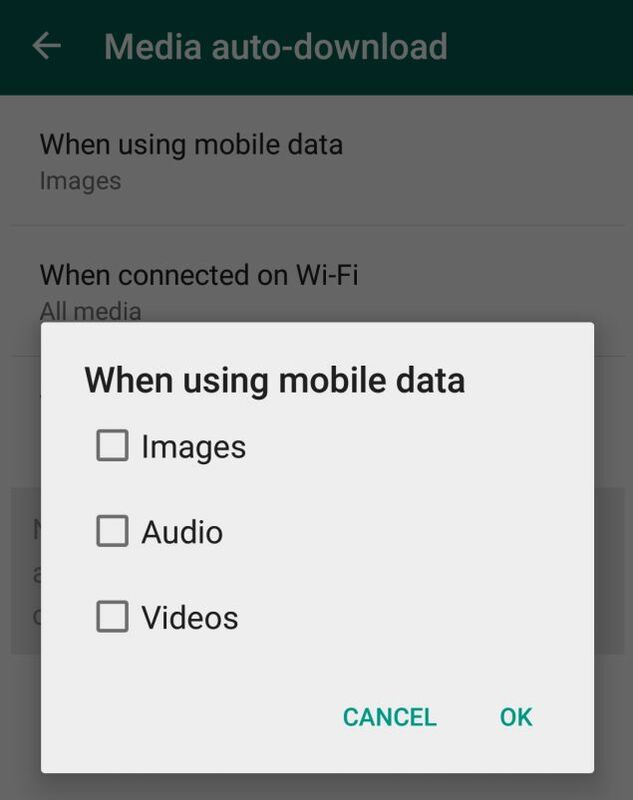 Go to Settings, Chat Settings, Media Auto-Download to specify when you want images, audio and videos to be downloaded to your phone. Go to WhatsApp Settings > Chat Settings > Media Auto-Download. 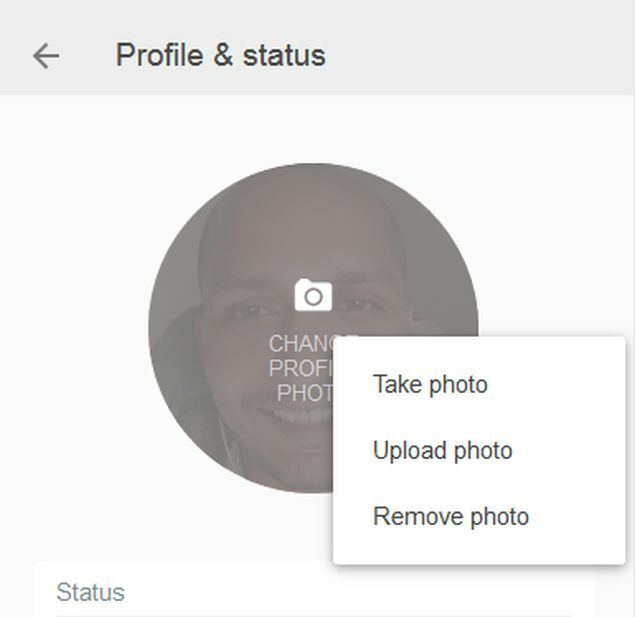 This new feature recently added to WhatsApp Web lets you tap on your avatar on the left hand corner, to change your profile photo with a laptop camera or webcam, or a photo on your drive. The feature also works with groups that you are an admin of. By default, WhatsApp lets everyone know the last time you used the app. 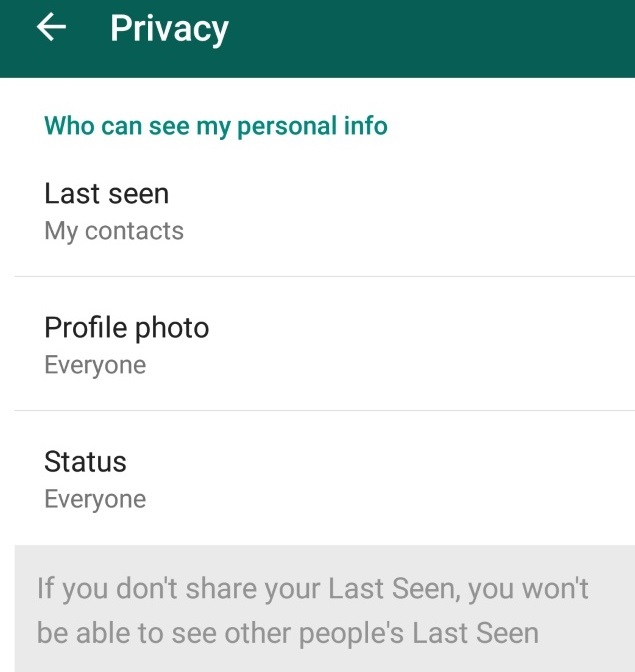 Your last seen timestamp, profile photo and status message can be toggled between ‘Everyone’, ‘My contacts’, and ‘Nobody’ in Settings > Account > Privacy on both iPhone and Android. Read Receipts, notified by those Blue Ticks can seem too obsessive and creepy. You can disable them too, but that also means you won’t be able to see read receipts from other people. 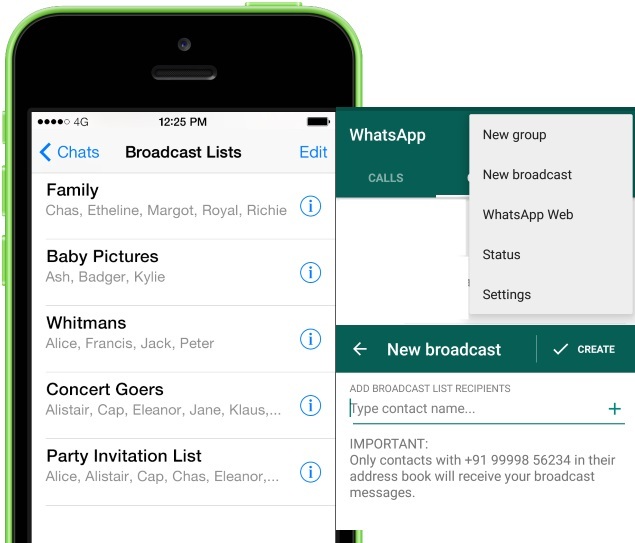 Apple users cannot use WhatsApp Web on their phone without jail-breaking the iPhone, but once you’re past that, this jailbreak tweak on the BigBoss Repo on Cydia enables you to use WhatsApp Web on your PC browser. The equivalent of Bccing your message, it’s cheaper than sending a group SMS. The replies from your broadcast will be visible only to you. Tap on Menu > New Broadcast, and select all the contacts you would like to round up for the message. Tap the Broadcast Lists button at the top of the Chats screen, tap New List at the bottom of the screen, filter from your contact list and then tap Create. 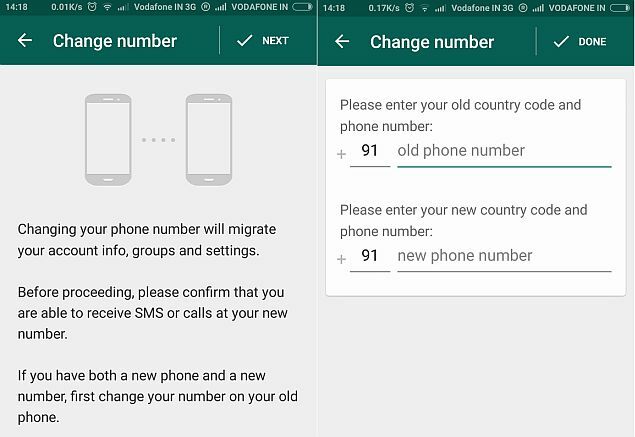 If you’ve changed your SIM card, there’s a way to import your account information, groups and settings. Keep in mind that your old number will be deleted. Make sure that your new SIM is active and able to receive SMSes and calls. Go to Settings > Account > Change Number, Enter your old phone number in the first box, and your new phone number in the second box. If you don’t really have the time to type a message, you can send a Voice message, or let Google’s speech to text engine, embedded in Google’s keyboard do the transcription for you. 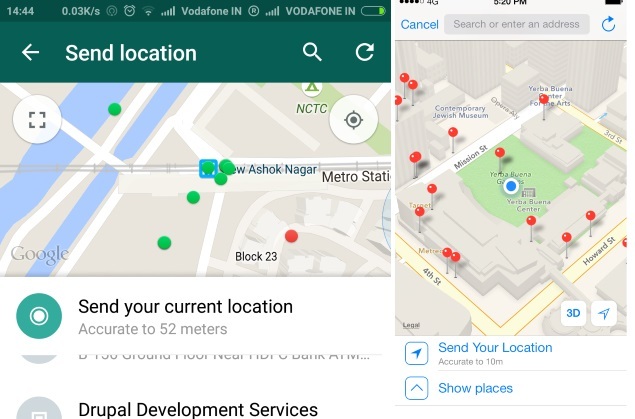 Tap on the Send location icon in the attachment pane to explore interesting hotspots around you. The map is a mash-up of FourSquare check-ins of places around you. You’ll find everything from local tech start ups to restaurants, marked as blue dots.